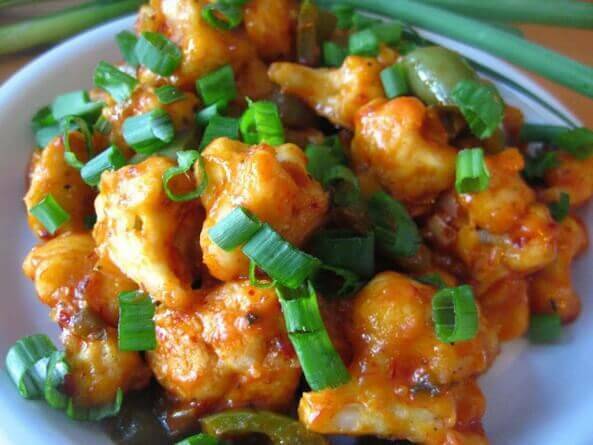 Skip the chicken and try out delicious Cauliflower Manchurian Recipe. Saucy Cauliflower has an amazing taste. You can serve it with Fried Rice. In a large bowl, combine all the ingredients from the batter list with enough water to make a thick batter. Line the baking sheet with parchment paper or aluminum foil and spread the coated cauliflower and spray with cooking spray. Heat oil in skillet and fry the chopped green chilies, ginger and garlic. Now add the ketchup, red chili sauce, vinegar, soy sauce, corn starch and salt mix well. Add ½ cup of water. Cook for 1-2 minutes until the sauce starts to thicken. Add the baked cauliflower to the sauce and mix thoroughly.